South Station Boston, a warm and misty mid-August, 2009, day. 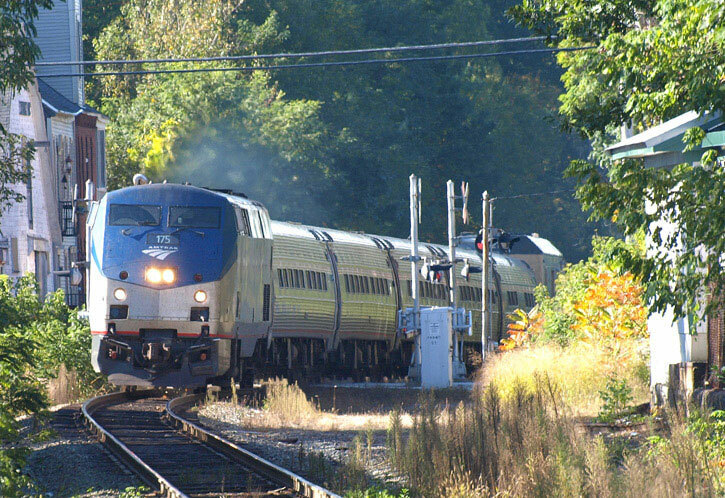 An Amtrak Acela approaches the station through a weed-invested yard as an MBTA Commuter Rail train awaits its own departure on an adjacent track. 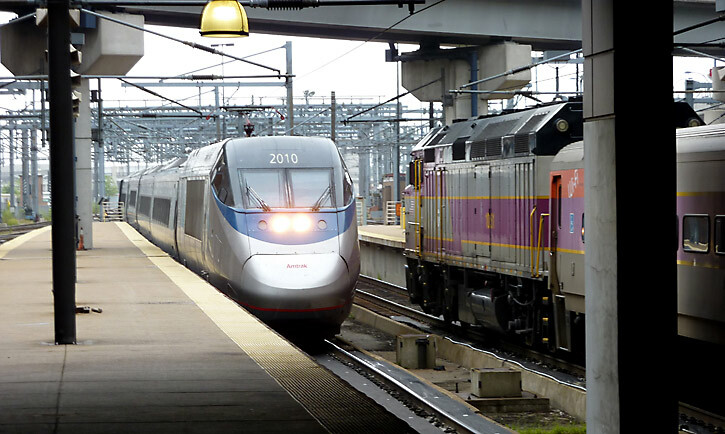 These are not the glory days for passenger rail many of us have hoped for. Congress is aiming at a draconian fiscal year budget for Amtrak with the help of the Obama Administration (is this the change we rail advocates can believe in?) and Massachusetts struggles mightily to get its transportation act together. The train on the right in this photo might have wi-fi, but the commuter rail train I arrived on a few minutes earlier was a rolling dump. Filthy interior, passengers were herded into a car that only had two windows clean enough to look out of, the crew could not answer the most simple questions, and, to add insult to injury, much of the trip in to Boston was on the 'outbound' tracks, leaving more than a few passengers on the wrong platform. I was assured that there were signs posted to warn travelers, but apparently they were so small and poorly placed nobody saw them. Of course, the electronic station signs were incapable of indicating the change. Just a wreck. And we taxpayers pay for this nonsense. Oh, and the train my wife and I took home after a Red Sox game featured doors left open for much of the trip. Yup, with a bunch of drunks on board. Camera: Panasonic Lumix ZS1 w/25-300mm built-in zoom. Its Monday, October 12, 2009, and here is the Downeaster arriving in Exeter, NH, on its way to Portland from Boston at around 10:30, a few minutes late. But who cares. A beautiful early autumn day and a successful train. Makes one glad to have a camera. Almost as good as a ride....and on this one I'll let the photo do the talking. December 6, 2009 and here's the Lake Shore Limited blasting through the first snow of the year past a freight siding in Westborough, Massachusetts. 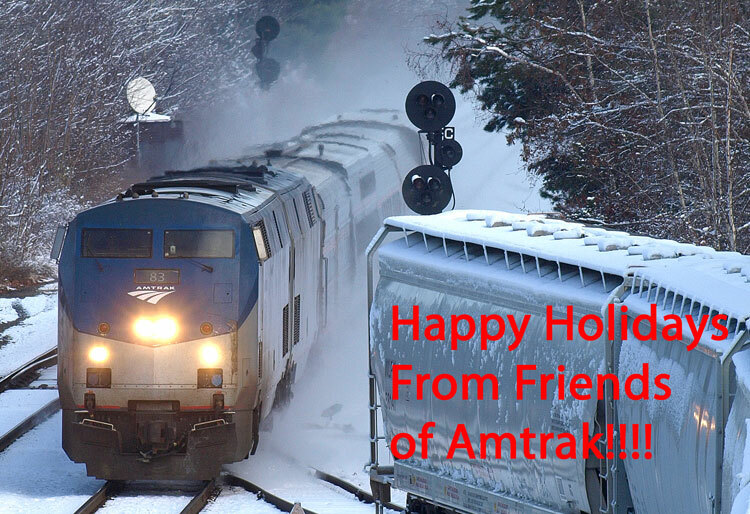 We're all waiting to see how Amtrak and passenger rail do in the New Year but there are some positive signs, and even the Boston section of the Lake Shore is a good omen -- recently restored sleeper service and a food car. Camera: Olympus E-510 dslr with 70-300mm telephoto. Time to be a bit sentimental. I spent several early childhood years in the little town of Towaco, New Jersey. It was pretty small then, and still is. On a trip to the area in 1966 I was able to photograph a commuter run on its way from Hoboken to Boonton and, eventually, Dover, on the Montclair-Boonton Line once owned by the Lackawanna Railroad. Stations and trains were pretty run down in those days and it wouldn't be long before the Erie-Lackawanna, a 1960 merger, went into collapse, merged into Conrail in the mid-70s after change in ownership. In 2009 I returned again with camera in hand and photographed another run out of Hoboken, now managed by New Jersey Transit. The station had been completely restored and the train was slick and smooth. Quite a contrast, and a real contrast to the steam trains I remember riding on as a kid, and on which my father and grandfather before him, commuted for many years. 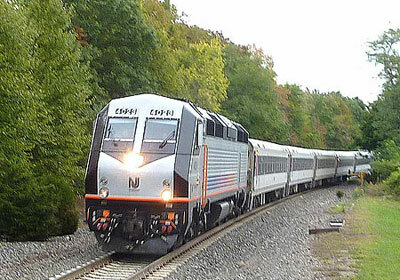 I'll be sharing many more photos of NJ Transit so check back often. -- Cameras: In 1966 a Nikkormat single lens reflex camera; in 2009 an Olympus 510 dslr with 40-150 mm telephoto zoom lens. Changes last made on: December 9, 2009.